Karl Sontag was the son of Franziska Sontag-Markloff and an actor named Wegener. He was the half brother of the singer Henrietta Sontag. When he was twenty years old he made his acting debut in Dresden. From 1851 to 1852 he worked in Vienna and afterwards he worked for seven years at the Stadttheater in Schwerin. He sometimes used the name Karl Holm for his appearances. In 1859 he moved to Dresden and in 1862 to Hannover. He also tried his had at writing plays but these efforts were less succesful. His play "Vom Nachtwächter zum türkischen Kaiser" led to his dismissal in Hannover. From 1877 onwards he only made guest appearances and he travelled to the USA several times. In 1885 he settled in Dresden and in 1900 he died there. He was buried in the grave of his mother. 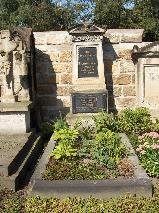 The grave of Franziska Sontag at the Alter Katholischer Friedhof, Dresden.